DOMINION: Chamuel is considered to be an archangel, his name meaning, "He who sees God." He inspires us to realize that we must first love ourselves, in order to love others. He gently guides us to view our own shortcomings. SAMPLE AFFIRMATION: I AM attracting Love and True intimacy with my perfect partner. 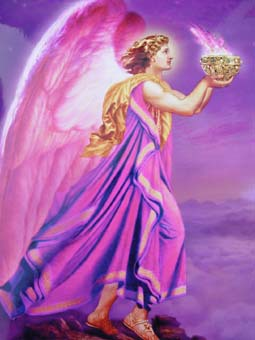 SAMPLE PRAYER: Archangel Chamuel, I have been having a hard time Loving myself as I should. Sometimes I get so down on myself that I don't always treat msyelf as well as I should. Help me to understand how important it is for me to Love who I AM, so I can give away Love, and in return, receive the Love I desire.